The Dodge and Burn tools in Photoshop Elements 11 adopt their icons from analog tools used in photography darkrooms. The digital counterparts are a great deal more flexible and precise. Dodging and burning originated in the darkroom, where photographers would salvage negatives containing areas that were too dark or too light by adding or subtracting exposure as an enlarger made the prints. An enlarger makes a print by projecting an image of a negative onto a piece of photosensitive paper. During the exposure, the darkroom technician can reduce the amount of light falling onto the paper by placing some object (often a disk shape of cardboard or metal impaled on a piece of wire) in the light path to dodge part of the image. The worker can burn other parts of an image by exposing only a small portion through an opening, such as the fingers in a cupped pair of hands or a piece of cardboard with a hole. For example, the worker in a darkroom varies the size of the dodging or burning tool by moving it up or down in the light path. Unfortunately, the closer the real-world tool gets to the paper, the sharper it appears, forcing the darkroom worker to move the tool more rapidly and frequently to blur the edges of the effects. With the Elements Dodge and Burn tools, you can specify the size of the tool and its softness by selecting one of the many brush tips available. You can also limit the correction to a specific tonal range in your image — shadows, midtones, or highlights. You can adjust the degree of lightening and darkening applied by specifying an exposure percentage, too. When you lighten very dark shadows that contain little detail, you end up with grayish shadows. Darkening very light areas that are completely washed out doesn’t make your image look very good, either. You’ll end up with white patches. In the Photo Editor, in Expert mode, open an image with under- or overexposed areas and select the Dodge or Burn tool from the Tools panel. In the Tool Options, select a brush from the Brush Presets Picker drop-down panel and also adjust the brush size, if necessary. Larger, softer brushes spread the dodging-and-burning effect over a larger area, making blending with the surrounding area easier, creating a more realistic, natural appearance. In the Tool Options, under the Range drop-down menu, select Shadows, Midtones, or Highlights. 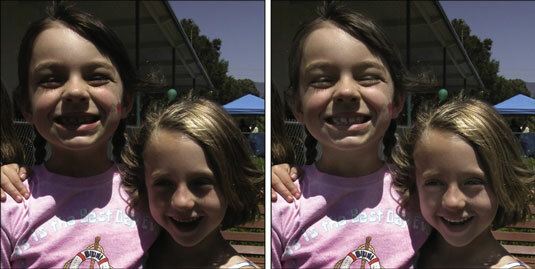 Select Shadows to lighten or darken detail in the darker areas of your image. Choose Midtones to adjust the tones of average darkness. And select Highlights to make the brightest areas even lighter or darker. Here, the original image had mostly dark areas, so the shadows were dodged. Note the increased detail in the eyes, teeth, and hair. A couple swipes were also given to the highlight areas with the Burn tool. In the Tool Options, select the amount of correction you want to apply with each stroke by using the Exposure slider or text box. Exposure is similar to the Opacity setting that you use with the regular Brush tool. Start with a lower percentage to better control the amount of darkening or lightening. High exposure values can overcorrect and produce unnatural-looking, obviously dodged or burned areas in your images. Drag or “paint” over the areas you want to lighten or darken, gradually building up the desired effect. You can make a selection prior to your dragging to make certain that the adjustment is applied only to that specific area. If you go too far, press Ctrl+Z (Command+Z on the Mac) to reverse your most recent stroke. When you finish, choose File→Save to store the image.